We greatly appreciate your custom, which is why we're pleased to announce this new loyalty program enabling you to build up "Reward Miles" that can be redeemed against certain future purchased. 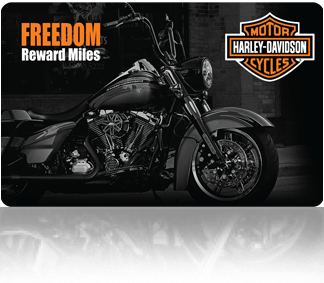 Every time you spend money on genuine Harley-Davidson products or services at an authorized participating Harley-Davidson® dealership your reward mileage increases. First Time Users - Please click here to activate your loyalty card. Please click here to login to your loyalty card webpage. Make sure you have your Loyalty Card with you at all times. Then, whenever you visit Harley-Davidson simply hand it over with your payment and we’ll credit your card. It’s that simple. Using your unique password to log on to your “members only” personal webpage on our web site you will be able to view your current “Reward Miles” balance as well as other special offers exclusive to Freedom card holders. Visit the site regularly to see your Reward Miles grow and the ways they can be utilized. Please login with your email and password below. Please login with your card number below.